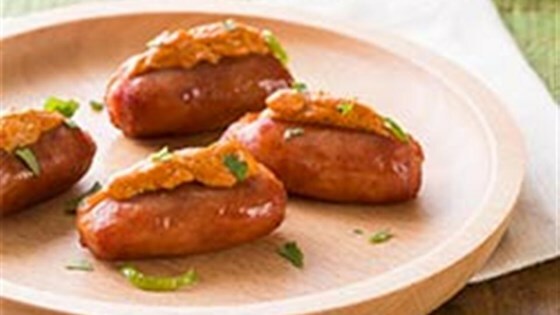 "Your guests won't be able to stop popping these stuffed smoked sausages with their creamy, spicy cheese filling." Mix cream cheese, chili powder, paprika and Cheddar cheese in a bowl. Transfer mixture to a zip-top bag and snip a small piece off of one corner of the bag. Split smoked sausages down the middle without cutting them in half. Squeeze a little cheese mixture into each smoked sausage. Place on a baking sheet. Bake for 15 minutes until heated. Serve hot, sprinkled with lime zest and cilantro.